For many visitors holidaying in The Gambia, it is quite possible to travel around Banjul's main attractions and the nearby resorts by taxi, bus or ferry transport. However, if you are planning a more adventurous trip and are keen to explore upcountry, bush taxis and hired cars are the major forms of transport. Green tourist taxis can be found outside most of the main tourist hotels in The Gambia. If you want to save some money, yellow and green taxis travel along set routes and the cost of these can be shared with other passengers. 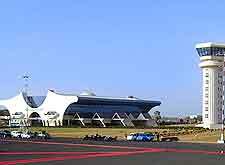 Banjul has its own international airport, which is also known as Yundum International. Located around 20 km / 11 miles from the city and within the small town of Yundum, taxis operate both to and from Banjul and nearby resorts. Direct flights operate from European airports, including London. 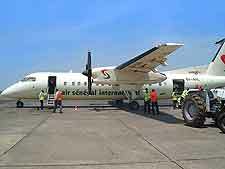 Other flights from within the region also fly to and from Banjul International Airport. 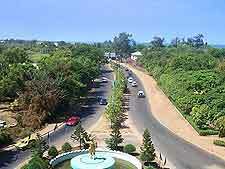 Cars and drivers can be hired from a couple of the larger hotels in Banjul, as well as from the airport. When planning a journey, it is worth making sure you leave enough time to take into account any delays. Many of the roads in The Gambia, particularly those which run upcountry along the northern bank of the River Gambia, leave a lot to be desired. During the rainy season, pot holes can exacerbate the problem of poor road conditions. Book your Banjul Car Rental here. 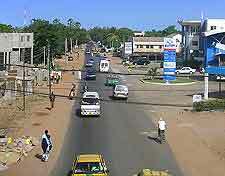 A number of bus services are available, taking visitors from Banjul to such towns as Basse Santa Su and Georgetown. The Banjul bus terminus can be found in Cotton Street. Buses mostly travel along the southern bank of the River Gambia. Long journeys can be made using a bush taxi. These are shared taxis that only set off for their destination when all the places have been taken. Comfort isn't high on the agenda and they're usually packed with people and luggage. Nevertheless, bush taxi transport is a good bet if you want to travel on a minimal budget. Ferry transport operates between Banjul and Barra. Whilst some are relatively large ships, others can only take a few vehicles. The River Gambia offers a great opportunity to get around the country and add more adventure to your journey. Boat excursions on the river are widely available through a number of tour operators. It's also possible to travel by boat one way and then make the return journey by bus.